Meaco is a brand that’s been hard to keep up with in recent years. A recent slew of impressive innovations – from the powerful and hygienic Zambezi, to the smart laundry dry functions of the Dehumidryer – have resulted in Meaco leading the way in domestic dehumidifier innovation. Their latest improvements center on further improving the energy efficiency of their appliances and also making them as quiet as possible. To meet this end Meaco have introduced their ABC range. Designed to offer a balance between performance and affordability the ABC sits nicely in the budget to mid-range dehumidifier market and offers stiff competition to brands like EcoAir and their popular DD122 range. Measuring just 463 x 300 x 250mm this compact unit is one of the smallest dehumidifiers available. It is ideally suited for use in small homes (2-3 beds) and flats to deal with condensation, excess humidity and rooms suffering from damp problems. It can even be used to dry washing – which is particularly handy during the winter months. Gone is the usual louvre located on the top of many Meaco dehumidifiers. 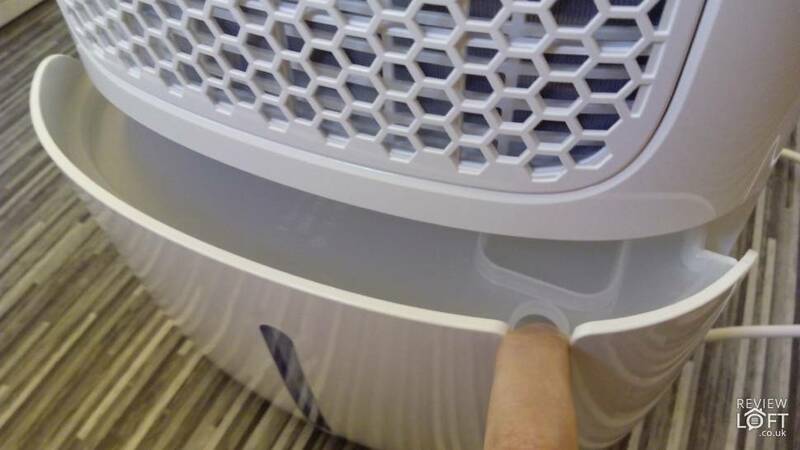 Instead, a static grill acts as the airflow exit vent and this is located directly on top of the unit next to the control panel. Because airflow is part of the key to lowering humidity we were initially concerned with the absence of a louvre. However, when switching on the MeacoDry we were impressed with the substantial airflow generated by the internal fan and it does not suffer the same problem as some Ebac units (which also lack a louvre) where airflow is typically poor. Around the back of the dehumidifier you’ll find the water tank and filter plus a recessed carry handle. One thing to note is that this dehumidifier is quite heavy and weighs in at 10.5Kgs. However, this normal for all compressor dehumidifiers and this actually puts the ABC in the lighter end of this spectrum with some compressor units weighing as much as 15-16Kg. That said, it is something to be aware of if you plan on moving your unit around your home and feel this might be a bit too heavy. In which case the usually lighter desiccant models might be a better choice. Using the MeacoDry is incredibly easy thanks to its simple and intuitive control panel. Plugging the unit in causes it to emit a familiar beep (common to Meaco units) and acknowledges the ABC is ready to use. You’ll also notice a small light blinking above the power button and this shows the unit is in standby mode. Looking at the control panel there is a range of 5 buttons which provide access to each of the ABC’s different functions. If this seems a little intimidating to start with you can simply press the on button and it will begin to automatically lower the humidity level in your home. But, for those of you who like to a little more control this dehumidifier also has something for you too. An impressive range of features and functionality can be accessed with nothing more than a few button presses. Moving left to right across the control panel the first button activates the laundry dry function. This causes the dehumidifier to run at its highest setting for 6 hours to help speed up the drying of washing. Once elapsed the unit will automatically switch to standby mode. Next is the fan speed setting. The MeacoDry sports two speed settings and you can use the higher fan speed to get an extra boost of power when you need it. Usually, fan speed also relates to the noise generated by a dehumidifier however during our tests (more on this below) we still found the highest setting to be incredibly quiet. Following on from the fan speed button is one of the most important on the appliance: the humidistat function. Using this you can control the ambient humidity level the ABC will work to maintain. Pressing this button causes the target humidity to increase in 5% intervals and ranges from 30% relative humidity (RH) to 80% RH. As you press the button the LCD display shows the current RH. One final thing to note about this setting is the CO function and our recommended humidity target. After reaching 80% pressing the humidistat button again will result in the display reading ‘CO’. This sets the dehumidifier to run continuously and never turn off. We’d really only recommend this setting to deal with excess damp quickly and not for day-to-day use. A more ideal target humidity threshold would be the 55% mark as this is considered the ideal humidity level for homes. The final two buttons on the control panel are for the timer and power button. 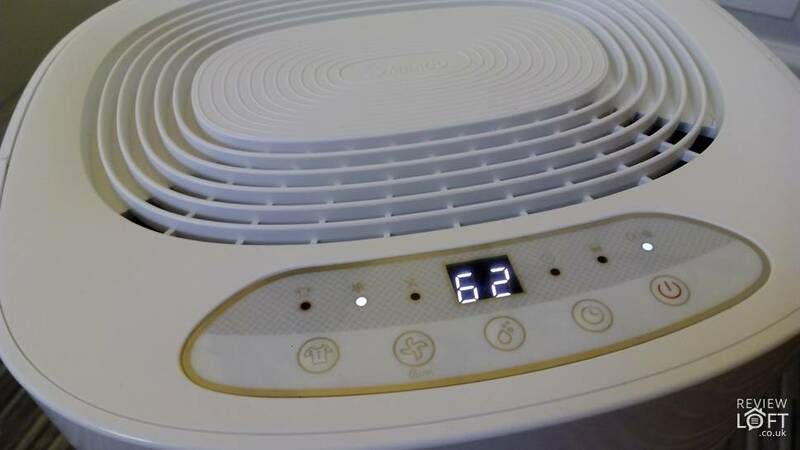 Pressing the timer button sets dehumidifier to run from 1 -24 hours (in 1 hour increments) before it automatically turns off. This setting is often used to keep a tighter control on running costs and is ideal when, for example, you know you’re going to be out for the day, but don’t want the dehumidifier running for all of that time. 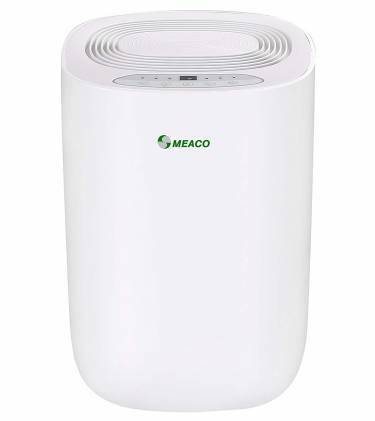 Like any good dehumidifier the MeacoDry features some extra useful and money saving features which might not be immediately obvious. The first is a child lock. 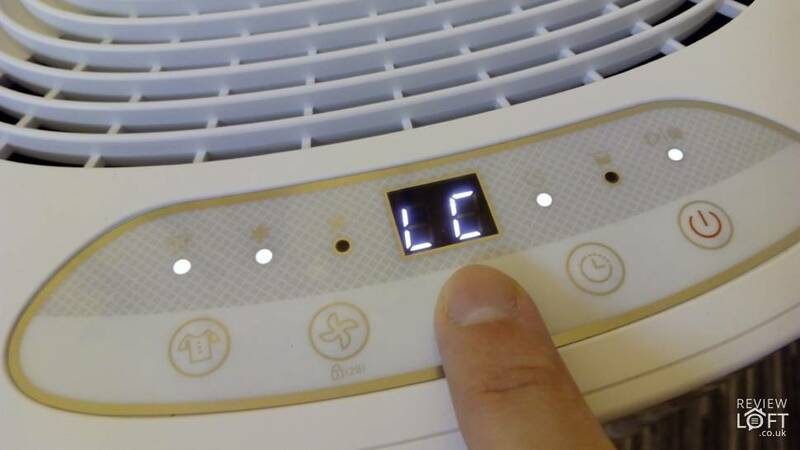 Pressing and holding the fan speed button for two seconds locks the controls and prevents little fingers from changing the settings. You’ll know when child lock has been activated because the screen will display LC for a few seconds on activating and deactivating this setting. The second is an auto-defrost function. In colder temperatures compressor dehumidifiers (such as this) often begin to decrease in performance and ice can begin to form on the condensing coils. The auto-defrost function detects when this is happening and stops the dehumidification process and starts it again once it is safe to do so. This feature protects the dehumidifier and ensures it is only running when it can be effective. Most compressor dehumidifiers can only operate in lower temperatures of around 10°C. However, the ABC can remain effective down to 5°C which is very impressive. Lastly is the control logic. The feature allows the humidistat to decide when to switch on or off the dehumidifier based on the target threshold. Essentially it is an energy saving feature that means the dehumidifier will only run when needed and allows for more hands-off operation. We were curious to see just how well the ABC performed when tested in a high humidity environment. Especially since this is a mid-range model by Meaco. Similar to when we tested some of the units from Meaco’s powerful Platinum range we placed the ABC in a bathroom immediately after showering, allowed a minute for the humidistat readings to stabilise, and then recorded its progress over 0, 10, 20 and 30 minute intervals to find out how well it tackled this tough challenge. The results were very impressive; Over the course 30 minutes the humidistat reduced the ambient humidity of the bathroom by 32%. A visible inspection revealed that the excess condensation which typically collects on cool surface such as windows and walls had all but vanished and the bathroom mirror was free from any condensation. Typically dehumidifiers aren’t the quietest of appliances – especially when they are running at their highest setting. One thing we noted during our tests was how the ABC bucks this trend. It was incredibly quiet at its lowest setting. And, as for its highest setting; the noise produced was slightly louder than the hum of a fridge. An impressive achievement by Meaco’s engineers. The water tank is a very respectable size for such a small unit and can hold up 2.6 litres of water between empties. Removing the water tank is very simple and two recesses located on the left and right-hand sides of the unit allow you to easily slide the tank out. It was also good to see that Meaco included a plastic cover on top of the tank to minimize the risk of spillages as you make your way to the sink to empty it. Should you want the ABC to work completely unattended it also features a continuous drainage option which can be accessed via hole located just above the top of the water tank. Unlike other dehumidifiers produced by Meaco the ABC does not arrive complete with a drainage hose so you’ll need to purchase one separately. Meaco cites this is because many dehumidifier owners generally don’t use the continuous drainage option and, as such, many hoses are disposed of and end up as landfill. We’d have to agree with this and can’t remember ever using the continuous drainage option functionality and view this as good ‘green’ move to reduce landfill waste. Something which always gets a thumbs-up from us. Meaco have truly developed another home run with their ABC range. Exceptional performance, low running costs and affordability make this appliance one of the best dehumidifiers you can buy. Not only this but Meaco have delivered on their promise of making one of the quietest dehumidifiers to date. It was hard to find any faults with this appliance and we look forward to seeing what Meaco have up their sleeves in future releases.